October 5, 2016 — “I’ve got something you’re gonna love,” My wife had just returned from a shopping trip when she said this to me and, since her sincere voice and sarcastic voice are extremely close to each other, I wasn’t sure what to expect. Maybe one of those blue shirts she’s always trying to get me to wear. I always regret wearing blue shirts. I barely heard what she said. I was overwhelmed. I mean, I knew what 1978 was. I knew what Halloween was. I knew what a festival was. I knew what beer was. I even knew what Anoka was. But I had no clue what 1978 Anoka Halloween Festival Beer was. Let’s start with that Anoka part. Anoka is a city in Minnesota just north of Minneapolis that bills itself as the Halloween Capital of the World. And that’s a big claim in 2016 when Halloween’s a multi-billion-dollar industry. But it is at least somewhat legit. In 1920, Anoka threw the first civic Halloween parade and celebration (well, Wikipedia hedges with “one of the first” and Anoka’s own page does the same with “It is believed”). The idea was offered by a local businessman to keep kids too busy to prank the town. You know, tipping cows and shaking outhouses and whatever else passed for pranks in early 20th century Minnesota towns. So the first city-wide Halloween party was a defense mechanism. Maybe they all started that way, I don’t know. I do know Salem’s Halloween party started partially as a reaction to the 1982 Chicago Tylenol murders. You weren’t ready for that kind of factoid in a post about cans, I bet. But the even more important proof for Anoka’s claim is that they kept up the tradition ever since except for two years in WWII when scarier stuff than ghosts and witches flew through the skies. That means the city is almost up to 100 years of Halloween parades. Heck, when this year, the United States Postal Service issued its first ever Halloween stamps and chose Anoka for its first day of issue. And now I know it had an official Halloween festival beer for a time. 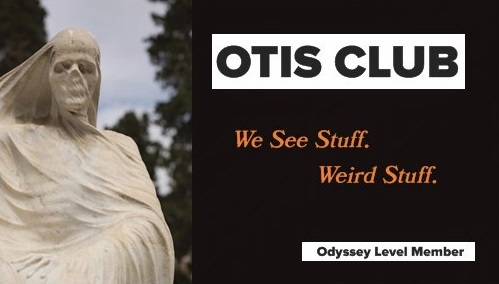 So that’s yet another exhibit in its Halloween case. The first thing I did after my wife showed me the can (well, the second—the first thing was to promise to take over laundry duty for the next three years) was to hold it up to the light like I’d just chosen wisely with my Holy Grail and then examined it minutely. Its pop-top was sealed (the charming directions on how to open it were punched into the top of the can), but its base had two triangular holes from the can opener that drained it for preservation reasons. 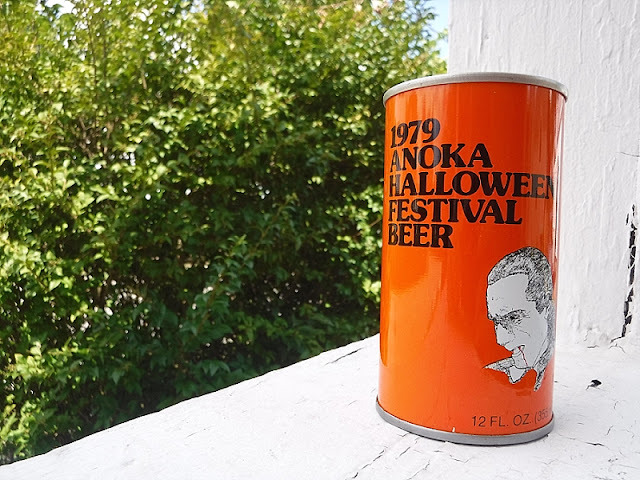 On the back of the 12-ounce can was a summary of the Anoka story in orange italics. 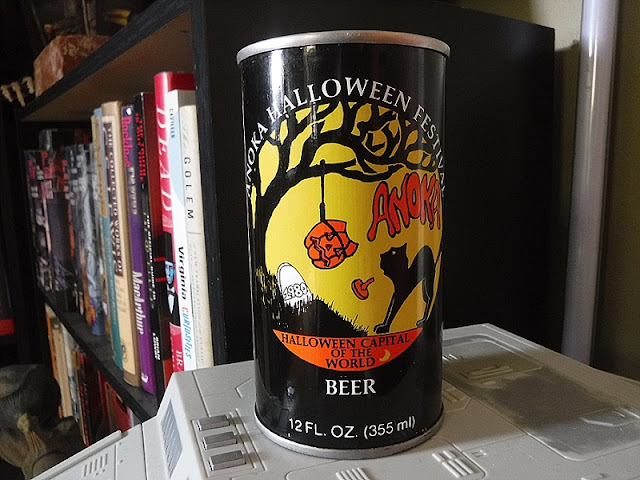 Also the phrase, “This beer sold exclusively at Anoka Liquor, Anoka, Minnesota, 55303.” The can listed the name of the brewer responsible for that little Halloween wonder as August Schell Brewing Co. in New Ulm, Minnesota. It turns out that every year between 1978 and 1981, the August Schell Brewing Co. (which is still around) released a beer to celebrate the season and the place. Every year the design of the can was different. That meant my next stop was eBay to pick up the other three cans in the set. The one in my hand was the very first Anoka Halloween Festival Beer can. The next can, 1979, was similar in format to the previous can. 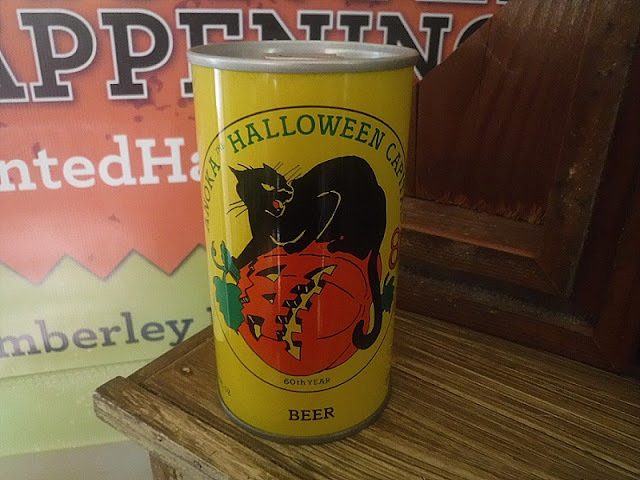 This time, though, it was black text on an orange can, and instead of a pumpkin and garland it was illustrated with a black-and-white ink sketch of Bela Lugosi’s Dracula, a thin rivulet of red running from a red fang down his chin. The text on the back of the can started out the same as the can from the previous year, but this time ended with a list of Anoka Halloween festivities—two parades, a costume contest, a queen coronation, a Pumpkin Bowl football game, foot races, window decorating, and “much more.” At the bottom edge of the can it read, “Recommended by Vampires the world over and sold exclusively at Anoka Liquor,” etc., etc. 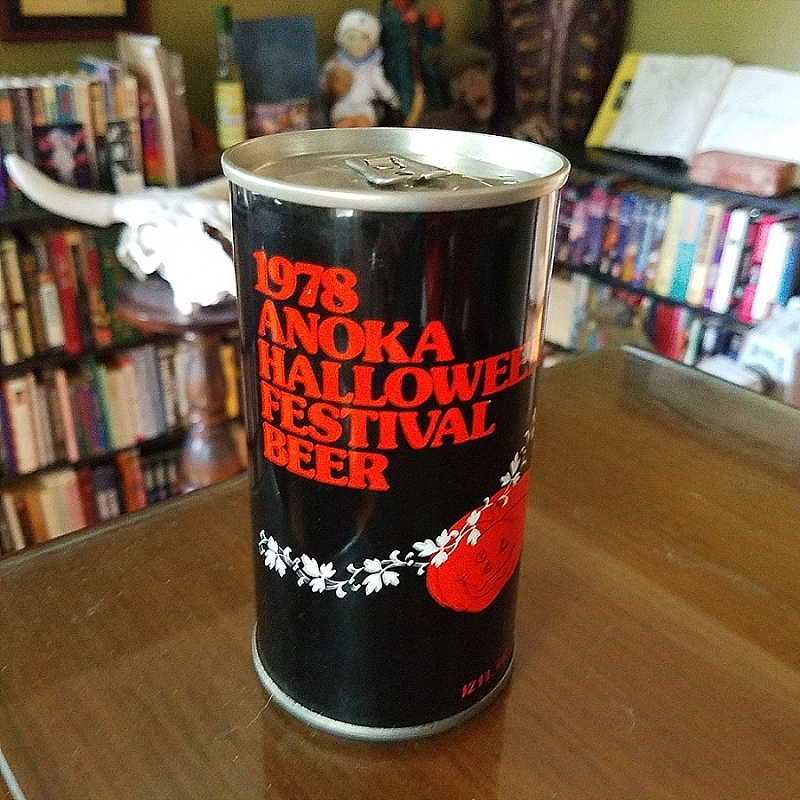 The back text is basically the same as the 1979 can, except that they added a wine tasting to the list of seasonal activates, and then altered the text at the bottom edge to read, “Recommended by Vampires, Goblins and Ghosts the world over and sold exclusively at Anoka Liquor,” etc., etc. Apparently, word of this beer was spreading throughout the underworld. The fourth can was the last one they did in the series. This time they went with a yellow background on which a black cat hisses protectively at something off-can while crouching on a toppled jack-o-lantern whose jagged face looks extremely victim-y. On the back, nothing else changed from the previous year’s can. 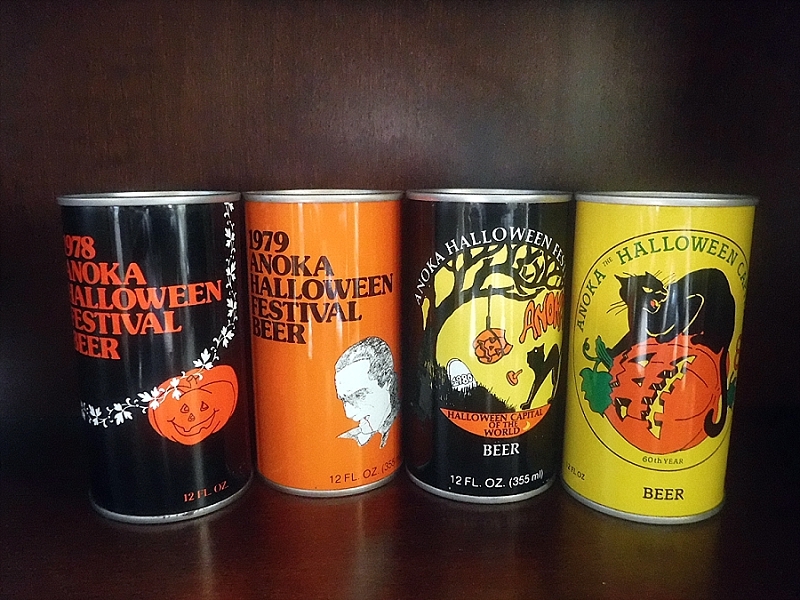 What befuddles me about this can is that it says, “60th year” under the jack-o, when 1981 would have been the 61st anniversary of the festival. And it wasn’t taking into account the war years, because that killed two celebrations. Nor was it a year related to the brewery since August Schell started in the 19th century. I don’t know. I have seen some sites list the start of the festival as 1921, but they are far, far in the minority. Maybe it was just an error, a mis-math printed permanently on tin. But that seems unlikely. I can't figure it out, so if you've got some insight, let me know. But…the biggest difference between the 1981 can and the others is…that I couldn’t find it on eBay when I found the others. I searched a few days in a row, but eventually gave up. Three out of four ain’t bad. Then, one day a few weeks later, the 1981 can arrived magically in the mail like some kind of Halloween miracle. And, like every miracle, there’s a rational explanation. I told Ben about the missing fourth can. So when two weeks later it showed up on my doorstep with no sender name, I knew exactly who to text. After all, nobody other than my wife knew about the cans, and she would’ve told me if one were coming. He replied to my text, “I ordered it on my phone while I was sitting on the couch at your house.” So Ben was my Great Pumpkin this year. And I didn’t even have to find a sincere pumpkin patch. Today, we live in the middle of a glorious Halloween phase in which everything from Pop-Tarts to paper towels to pet food are wrapped in Halloween packaging. Hell, I have like two dozen Halloween soda cans of very recent vintages sitting in a plastic tub in my basement. But, these, these Anoka Halloween Festival beer cans are artifacts of a different time and place. A different Halloween. A time before anybody’d ever heard the phrase “pumpkin spice” or the crunchy beat of Thriller. A place that still does Halloween all the way every October, even after almost 100 years. And I still have no idea how that first can made it 1,400 miles to southern New Hampshire.